Frank Harper was born in Beeston, Notts in 1894, apparently the son of Mary Ellen Harper (b. c1872, Beeston)2. In the year after his birth, his mother married James Sheldon3 but, in 1901, Mary Ellen is living at 69 Upper Regent Street, Beeston with her parents, Joseph (b. c1850, Beeston) and Mary Ann Harper (b. c1852, Swanwick, Derbyshire. nĠ Draycott) but her husband James is not present. Frank is then recorded as the son of Joseph and Mary Ann, his apparent grandparents4. By 1911, Mary Ellen was living at 40 Lower Regent Street, Beeston with Frank, recorded as her son, then aged 17, who was working underground in a colliery as a horse driver. Her husband was again absent although three boarders were living in the household5. As Frank's Army Service Record has not survived, we do not have a precise record of when he enlisted, but it was probably in September 19156. By that time, it appears that he may have been married and was living in Aston, Birmingham and, presumably for this reason, he joined the local Royal Warwickshire Regiment7. After initial training, it is likely that he joined 16th Battalion in France, as part of 15th Brigade of 5th Division, in time to face the terrible experience of the Battle of the Somme in the summer of 19168. During 1917, the battalion took part in the Arras battles - at Vimy Ridge and the Third Scarpe - and then in several of the terrible encounters of the Third Battle of Ypres - known as Passchendaele. Then, in December 1917, the battalion moved to Italy as part of reinforcements to the front there, after severe setbacks by the Italian army. After the German army withdrew from Italy to concentrate on its Spring Offensive on the Western Front, the battalion returned to France at the beginning of April 1918. In the last days August 1918 the battalion took up a position in action south of Bapaume as part in the Second Battle of Bapaume which had began on 21st August. This was the second phase of the Battle of Amiens, the British and Commonwealth attack that was to become the turning point of the First World War on the Western Front and the beginning of the Allies' Hundred Days Offensive. But this was the early stages and there was still much fighting to be faced starting with a big offensive which began on the 29th. Private Harper was amongst those killed, on either the 31st August or 1st September.9. He was buried in the nearby Favreuil British Cemetery. Favreuil is a village in the Department of the Pas-de-Calais about 2 kilometres north of Bapaume. It was occupied by British troops in March, 1917, lost in March, 1918, and retaken by the 37th and New Zealand Divisions on the 25th August. 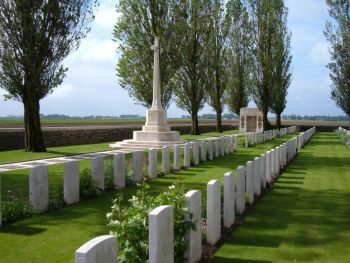 The cemetery was begun in April, 1917, and used until March, 1918, by fighting units (particularly of the 62nd (West Riding) Division) and Field Ambulances. Further burials were made in August and September, 1918, and after the Armistice British graves were brought in from the neighbouring battlefields and other burial grounds. There are now nearly 400, 1914-18 war casualties commemorated in this site10. Private Harper was posthumously awarded the British War Medal and the Victory Medal11. His financial effects, amounting to £8 5s 5d were paid to his 'widow (Mary E)', on 4 January 1919 and she also received his War Gratuity of £13 10a on 12 January 192012. Although the subsequent life history of his father, mother, wife and child have proved difficult to track, it appears likely that his mother died in 1918, aged 4513. 2Although it has not been possible to be absolutely sure, it appears that the identity of the 'F Harper' who is remembered on the Beeston War Memorial is the Frank Harper whose birth was registered in Basford Registration District (of which Beeston was part) in Q1/1894 (Ref 7b 210). No maiden name is recorded for his mother in the extended GRO index, indicating that she was then unmarried. This tends to be confirmed by his relationship to her, declared in the 1911 census. 3Mary Ellen Harper marriage to James Sheldon was recorded in Basford Registration District in Q3/1895 (Ref 7b 222). It has not been possible to conform the identity of James. 4Beeston, Notts, 1901 Census, Piece 3153 Folio 120. 6The probable date of Frank's enlistment has been calculated from the amount of his War Gratuity. 7His entry in 'Soldiers Died in the Great War' records that he was then resident in Aston, Birmingham and that he enlisted in Birmingham. A notation in his Medal Roll entry suggests that he may have been assigned to 9th Battalion for a brief time. His marital status is discussed in Note 12. 8Details of the 16th Battalion's deployment in 1916-1918 are based on the Forces War Records website (www.forces-war-records.co.uk/units/316/royal-warwickshire-regiment). 9Although most records, including his Commonwealth War Graves Commission memorial page, state that he died on 1st September 1918, a correction to the Grave Registration Report attached to the memorial page suggests that he died on the previous day. 11Details from Franks's medal card and his entry in the Medal Roll - available on ancestry.com. 12Details from "Army Register of Soldiers' Effects, 1901-1929" - available on ancestry.com. His financial effects are recorded as paid to 'Wid(ow) Mary E & child'. This appears to confirm that he was married with a child. Apparently coincidently, his wife's name had the same forename and middle initial as his mother. 13Apparently recorded in Basford Registration District (of which Beeston was part) in Q2/1918 (Ref 7b 191).